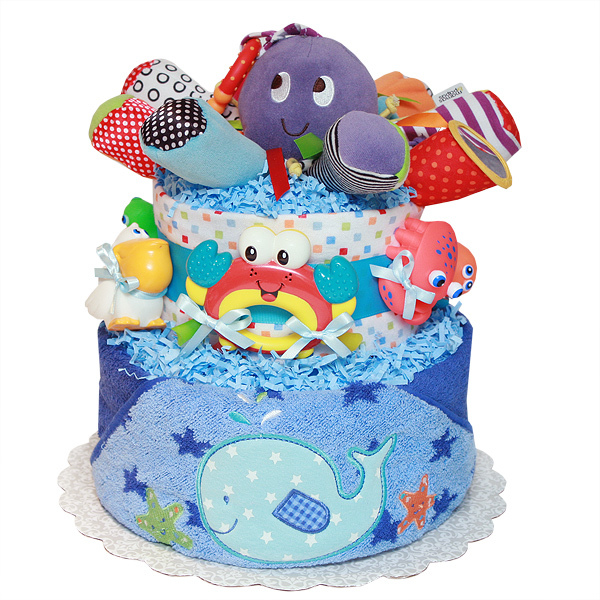 Practical and handmade two tiers Whale Fun Ocean Diaper Cake is made of 40-45 Pampers Baby Dry and Pampers Swaddlers diapers size 1 (7-14 lbs. ); one flannel receiving blankets 100% cotton; one hooded bath towel with a whale; one octopus toy; one teether crab toy; one rattle toy; four bath squirters. Decorated with coordinated ribbons, bows and pins. This cake sits on a 12" corrugated cake board, 12" high. Comes wrapped in cellophane with coordinating ribbons and bows. All our diaper cakes made of highest quality ingredients with greatest care and love. Everything included is ready to use and easy to disassemble.